Mary has appeared so many times before multitudes, performing countless miracles to catch our attention to be serious in serving God, by obeying His commandments and pray without ceasing. She has kept asking us to do acts of self-denial. And she has told us how even good people are not listening to her. The need to pray for the salvations of souls is so urgent. Not that many people have listened to her, they just enjoy the miracles, like it is a side show. Centuries has past and most of us, are still not listening to her. 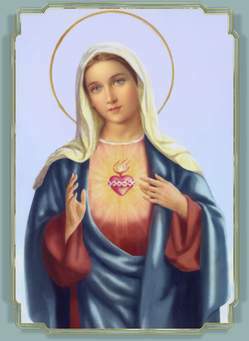 Mary has told the children of Fatima to spread the Devotion of the Immaculate Heart of Mary, because Jesus wants it. Now Jesus has told the prophetess Maria Divine Mercy that we should say the three mysteries a day, which takes about an hour, because of the urgent times we are now living in. I know a great many people have difficulties in the idea that Jesus actually wants all people including the Protestants to say the rosary every day, but it is simply the truth. Many people try to explain away all these visitations of Mary as if it they are not true apparitions. There was miracles of the sun and everybody there saw it at Fatima. I have watched a show once that two men claimed that what the people really saw was UFO’s ships. It was not like it was the only miracle that had ever happen or the only apparitions that has ever been recorded in history. The evidences that God has left behind some of the apparitions are incredible. Science are at a lost to explain them and yet people do not look into it for themselves and find out about it. I believe if people do it would change how they would see Mary and Jesus’s love for her. I remember one of the times Mary appeared to countless of people, I think it was the Apparitions at Medjugorje, people had rosary beads. The rosary beads that had silver chains turn into true gold and the rosary beads that had gold chains turned into silver chains. There is so many miracles I don’t know why people don’t believe they come from God. God works through all who surrender to Him. Mary’s life example is so humble, faithful, courageous, beautiful and amazing. All Catholics I believe that have a genuine devotion to her or any saint get visitations or communication most of the time, in this day and age. I personally believe only a few wouldn’t, maybe I am wrong I don’t know, but I do know a great many people do receive visitations from Mary, me included. Mary wants to help us if we will only be humble enough to let her. I have asked her for help so many times and she truly does help. Not long ago I was really praying from my heart for Mary to help me learn humility. Mary said that she will help me, which gave me encouragement no end. Then fairly recently I was saying a novena to Sister Josefa Menendez as well to help me grow in humility and she assured me that I will receive the grace. They do really help out. Mary told the Fatima children that, ….’In the end my Immaculate Heart will triumph.’ This was said in 1917 AD. I have heard that during the Great Tribulation, things are going be so desperate that all denominations of the Christian Faith will unite just in order to survive. The more ammunition you have to use to survive in this war between good and evil the better are your odds. That is why I try to push Mary onto people a great deal. Her prayers strengthens yours. The prayer of the Immaculate Heart of Mary Rosary only takes about 5 minutes to complete. I have an article on it in this blog if you want to have a look at it. It is worth saying this prayer as long as you can. I try to do it an hour at a time. I believe a true prayer life is like food. If you only eat cabbage for example you will get sick, to stay healthy you need a variety of different foods. I believe this is true of prayer. There are all sorts of different types of prayers and they are all in urgent need to strengthen your relationship with God and one another. For example there is a time of just rest in the Lord another time to meditate on the word of the Lord and another time to worship and praise and another time I call chit chatting to God and there is a time to intercede for everybody who is in need etc. If is not done from the heart you’ll end up becoming luke warm. The more you sincerely love God the more you are going to love your brethren in Christ and you will want to help out. This truth doesn’t change just because you go to heaven. You will still want to help out with people who are struggling on earth. Why do people have such a problem with that? You know the earliest prayer to a saint to ask for help to my knowledge was a prayer to St. Joseph. It was found in fifty AD. People of the first Century who knew both Jesus and St. Joseph would of have said this prayer. It is a very powerful prayer, because St. Joseph lived a very holy life on earth. If we do that too our help in heaven will also be very powerful.